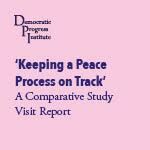 This report details the discussion that took place during DPI’s Comparative Study Visit to Southern and Northern Ireland in April 2015. Participants in the visit included government advisors, policy makers, high level journalists and media personalities, academics and members of Turkey’s Wise Persons Committee. During the visit key actors from Northern Ireland’s peace process were met with, in Dublin, Dundalk and Belfast. Speakers included former Irish Prime Minister Bertie Ahern, former Irish Minister for Foreign Affairs Dermot Ahern, and Chair of the Good Friday Agreement, US Senator George Mitchell.